Amazing, colour-changing flowers to fire-up your containers. A striking, colour-changing bedding and patio plant with gorgeous glowing heads of orange and hot pink. An absolute stunner for your garden this year, individual flowers emerge peach and deepen to a fabulous deep pink. Perfect for pots, baskets and the front of your hot flower borders where the vibrant flowers can froth spectacularly in all directions. These easy to grow plants produce a compact mound of soft, corrugated foliage which compliments the flowers perfectly. With a height and spread of around 40cm (15in) we supply 12 x sturdy plug plants, ready to pot up into containers or individual pots. Lantana Esperanta is a striking colour-changing plant for summer bedding and patio containers with gorgeous glowing heads of orange and hot pink - an absolute stunner for your garden this year. Individual flowers emerge peach and deepen to a fabulous deep pink, and are carried above a mound of soft, corrugated leaves on semi-erect stems, making it perfect for pots, baskets and the front of your hot flower borders where the vibrant flowers can froth spectacularly in all directions. These easy to grow plants brighten any colour scheme, and they flower all summer from early June, right up to the first frosts. The verbena-like flowers attract a great range of pollinators, and your baskets will become a mecca for butterflies. With a height and spread of around 40cm (15in) we supply 12 x sturdy plug plants, ready to pot up into your containers or grow in in individual pots. Supplied as 12 x sturdy plug plants, ready to pot up into your containers or grow in in individual pots. To encourage more flowers, deadhead regularly. Overgrown plants can be given new life by cutting back a third of their growth and they will bounce back quickly. On receipt, either pot up the plugs and allow to grow on before planting out, or, if growing in pots or baskets, plant them directly into their containers. 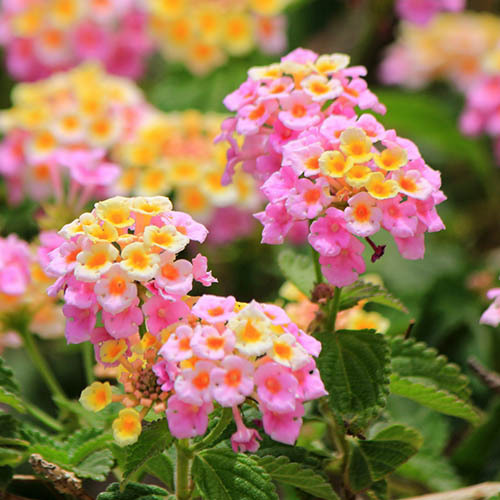 Newly planted lantanas require regular watering, however once established, these plants require little maintenance and are even tolerant of somewhat dry conditions. A good soaking once a week will keep them happy (more frequently if the weather is hot and dry).